​To prolong the beauty of your rug, Melrose Oriental provides expert cleaning in our Melrose facility for all types of hand made rugs, including: wools, silks, dhurries, braided and needlepoint rugs. Pick up and delivery service is available. To preserve their beauty, Oriental rugs should be professionally cleaned, every two to four years. Melrose Oriental Rug uses a process that includes hand washing the fine rugs with soap that is created specifically for wool. Automatic machines are not used. Cleaning detail is given to the fringe as well. 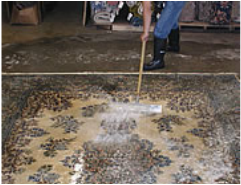 Depending on the size of a rug, it is then either rinsed in a large extraction machine or rinsed by hand. After rugs are cleaned they are hung in a climate controlled dry room where low heat and dehumidified air allows them to dry slowly – without harming the natural lanolin in the wool. 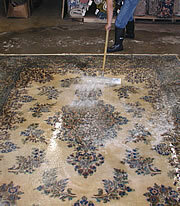 Each rug is vacuumed and inspected to complete the process. All rugs are insured. 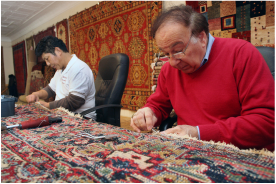 As a courtesy, each customer is called by a member of the Mouradian family to ensure that the rug was cleaned to their satisfaction. Professional cleaning of any spot large or small, is recommended. However if you need to address a stain quickly, Club Soda (or a mixture of ½ white vinegar and ½ water) will neutralize most stains including those from pets, wine, coffee etc. – as long as the stain is tended to quickly. Carefully test an inconspicuous area before beginning to spot clean a rug to ensure that colors don't run. 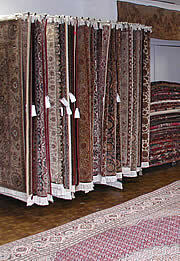 Melrose Oriental offers rug restoration service by in-house expert staff. When fringe is fraying it can be repaired by overcastting the end to prevent further deterioration or in some cases, refringing the rug by hand can make it appear new. Melrose Oriental also handles the restoration of worn edges. ​Proper padding will make the rug last longer, feel better and prevent it from slipping. Appropriate padding suggestions will be made when your rug is purchased. ﻿Experience a different way to Purchase handmade Oriental rugs with an in-home consultation. Live with the rug before purchasing! With proper care your rug can last a lifetime and be passed on for generations. Expert Oriental rug cleaning at our Melrose facility. 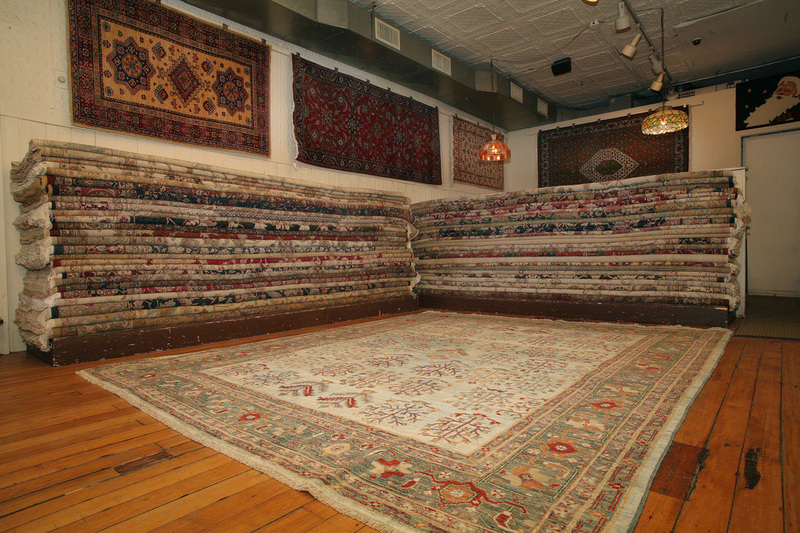 Melrose Oriental Rug Co. offers expert rug repair and restoration service by our experienced in-house repair and restoration staff. Copyright © 2018. Melrose Oriental Rug Co.